Front of Laura Secord Homestead.Photo by Jee Yan Chu. Stone marker placed on the east side of the Secord property in 1901 by the Women's Literary Club of St. Catharines to honour Laura Secord, rededicated in 1972 by members of the Women’s Literary Club of St. Catharines on the occasion of their 80th annual pilgrimage. Photo: Alex Ayotte and Ian Wood. Heritage Canada plaque unveiled on the south edge of the property in May 2006, recognizing Laura Secord as a person of historical significance. The Laura Secord Homestead stands as a monument to the heroic actions that Laura performed. It was fully restored in 1971 and displays many of the furnishings and characteristics of what the home would have looked like in the 1800s. 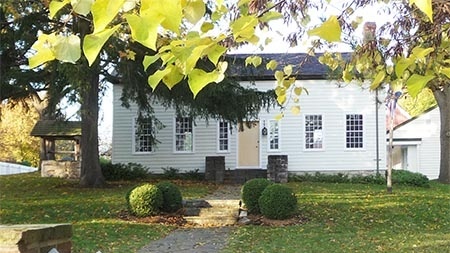 From this modest homestead in the town now known as Queenston, Laura Ingersoll Secord made her famous 32 kilometre (20 mile) trek to DeCew House in Thorold to warn the British forces of an impending invasion by the American militia. The Laura Secord Homestead was fully restored in 1971 by Laura Secord Incorporated. Now managed by the Niagara Parks Commission, it stands as a landmark museum and historic site. Interpretive signage and guides in authentic period costumes explain the history of Laura Secord's heroic journey, the homestead, and surrounding area. Daily from 10 am - 5 pm. Last tour begins at 4:00 pm. Wednesday through Sunday, 10 am - 4 pm. Last tour begins at 3:00 pm. All times subject to change. Please call ahead for details. 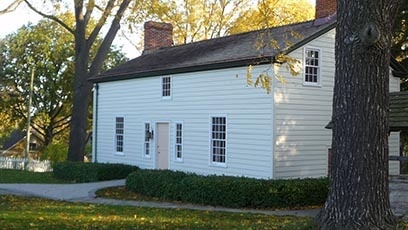 The restored Laura Secord homestead at 29 Queenston Street is the site where Laura Secord began her famous 1813 trek to warn the British of the impending American invasion. 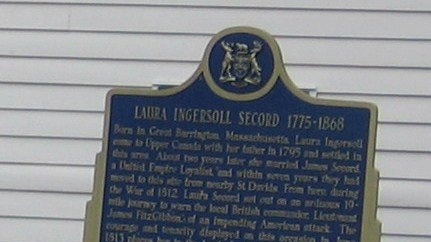 It is also where Laura and James Secord raised their seven children. James was a merchant, and sold local produce and other goods in a small shop located on the property. Queenston was a lively centre of local commerce at the time, with several inns, taverns, shops and distilleries. But the town was hard hit by the War of 1812, suffering multiple attacks and American invasions. The Secord house was ransacked twice and had all its windows broken in various skirmishes. James Secord later wrote of how he was 'twice plundered of all his moveable property' by American invaders during the war. James was seriously injured and incapacitated during the war, and when peace finally came in 1814, the Secord family was thrown into poverty. It wasn't until 1833 when James got a job as the registrar of the Niagara District Surrogate Court that better times arrived. In 1835 the family moved to Chippawa after James got a job as collector of customs. It is unclear who owned the homestead after the Secords left. Records remain scarce until 1895, when the Shephard family purportedly took over the house, owning it until the 1960s. The house was renovated and changed extensively over the years. James died in Chippewa in 1841 and Laura moved to 3800 Bridgewater Street in Chippawa. There she lived for 27 years, dying on October 17, 1868 at the age of 93. James and Laura were both buried in the Drummond Hill Cemetery near Lundy's Lane. 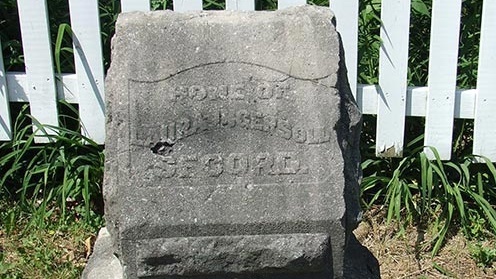 A stone marker was placed on the east side of the Secord property in 1901 by the Women's Literary Club of St. Catharines to honour Laura Secord. The homestead was fully restored in 1971 by Laura Secord Incorporated, the confectionary company established in 1913, and was furnished with original furniture and period artefacts. The stone marker by the front entrance was rededicated in 1972 by members of the Women's Literary Club of St. Catharines on the occasion of their 80th annual pilgrimage. 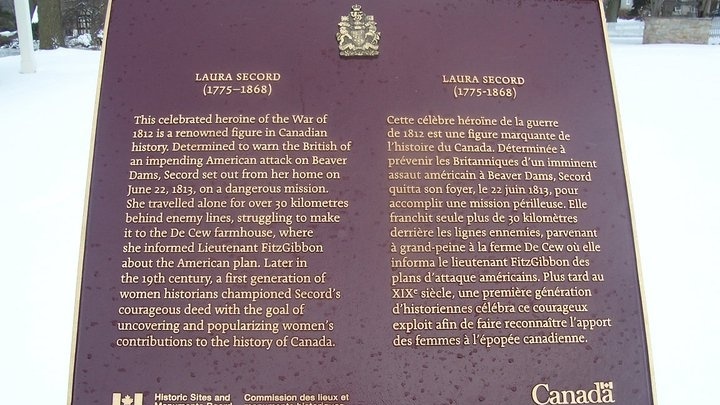 In 1976, the Archeological and Historic Sites Board of the Archives of Ontario erected a plaque commemorating Laura Secord in front of the property. The homestead was gifted to the Niagara Parks Commission in 1998. In 2003 the Niagara Parks Commission applied to theHistoric Sites and Monuments Board of Canadato have Laura designated"a person of national historic significance"by the Minister of Canadian Heritage. In May 2006 a plaque recognizing her national historic significance was unveiled on the south edge of the property. Today the Laura Secord Homestead is open from May through October by the Niagara Parks Commission as a museum and historic site. Guides in authentic period costumes tell the story of Laura Secord , her homestead, and the history of the area, and her legacy and contributions continue to inspire new generations of visitors. Located along the Niagara River Recreational Parkway and the Niagara Heritage Trail, minutes away from Queenston Heights Park. The Parkway links: The McFarland House, Laura Secord's Homestead, The Mackenzie Printery and Newspaper Museum, Sir Adam Beck II Generating Station and Old Fort Erie.